Spring is in the air and that means that this year's Gooseberry Patch cookbooks are hitting the market. The first one to arrive on my doorstep is Good-for-You Everyday Meals, a perfect cookbook for those of us who want to make healthier decisions in the kitchen. It can be so overwhelming to look at all of the healthy-living cookbooks on the market: vegetarian, vegan, paleo, and anti-inflammatory just to name a few. So, it's nice to see that Gooseberry Patch has released some healthier recipes, recipes that are submitted by readers from across the country which means that the average cook can tackle these recipes. These recipes show that small changes can help you make healthier choices, changes such as using more fruit, vegetables and whole grains in your cooking, adding wheat bran and flax seeds, using reduced-fat dairy and reducing the amount of sugar is your dishes. The book opens with breakfast recipes such as smoothies, freshly-squeezed juices, eggs dishes, and whole grained baked goods. We can get easily bored with salads. Salads hold my interest for about a second. 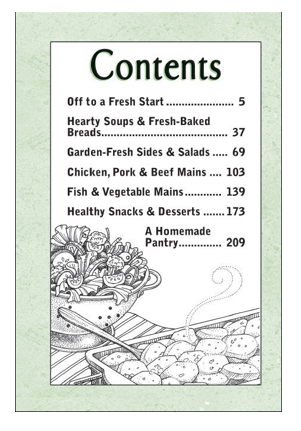 But, this cookbook offers some unique choices such as Minted Tomato-Cucumber Salad and Arugula and Nectarine Salad. The chapter on healthy snacks and desserts features dips, spreads, sorbets, and fruity pops. 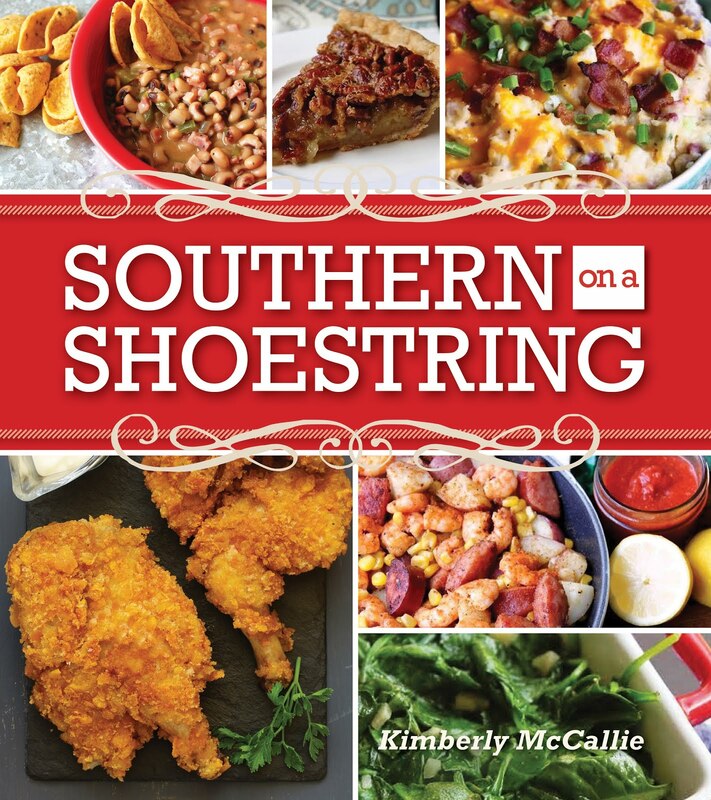 The most unique feature to this cookbook is the final chapter, A Homemade Pantry, which features recipes for spice blends and condiments. Making your own spices and condiments is the perfect way to control the amount of sodium and preservatives in your food. 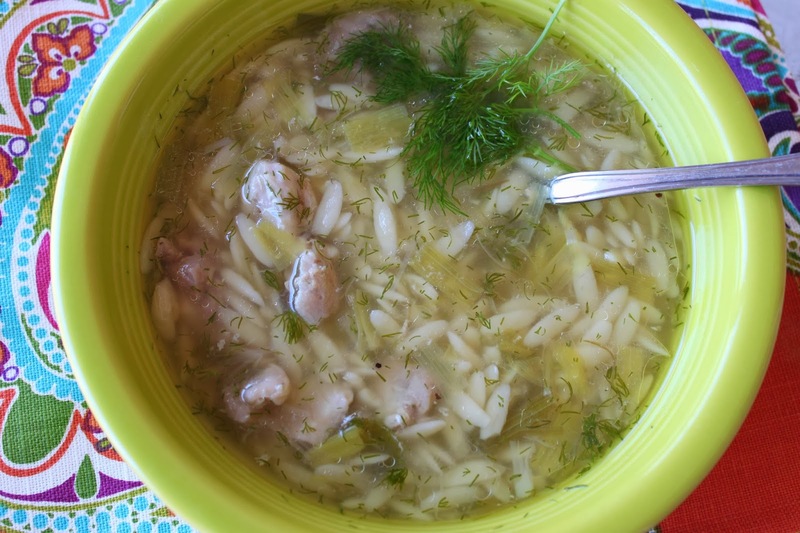 I've highlighted Chicken and Orzo Soup from the Hearty Soups and Fresh-Baked Breads chapter and Sisters' Baked Harvest Vegetables from the Fish and Vegetable Mains chapter. Heat oil in a large soup pot over medium heat. Add leek and celery; cook, stirring often, until vegetables are tender, 5 to 8 minutes. Add chicken and broth; season with salt and pepper. Bring to a boil; reduce heat to medium-low. Cover and simmer until chicken juices are no longer pink, about 15 to 20 minutes. Remove chicken to a plate, reserving broth in soup pot. Let chicken cool; chop. Meanwhile, return broth to a boil. Stir in orzo and cook until tender, about 8 minutes. Stir in chicken and dill; let stand several minutes, until heated through. Serve bowls of soup with lemon wedges for squeezing. Serves 4. Kim's Take: I diced the chicken before cooking to save myself a step of having to remove the thighs to chop and return to the pot. I love orzo so added an extra handful (or two). But, it was that dill that really put this soup over the top and made this soup unique instead of an ordinary chicken soup. The work that kept coming to mind as I was eating it was that the dill "livened" up the soup. Don't leave out the dill! Combine all vegetables in a lightly greased 13"x9" baking pan. Drizzle with olive oil and toss to coat. Sprinkle with soup mix and toss again. Bake, uncovered, at 350 degrees for about 45 minutes, until all vegetables are tender. Makes 8 servings. Kim's Take: The potatoes are the barometer for this dish. The dish must cook until the potatoes are done. I suggest cubing the potatoes much smaller than the rest of the vegetables so that they can cook within the same time frame as the rest of the vegetables. 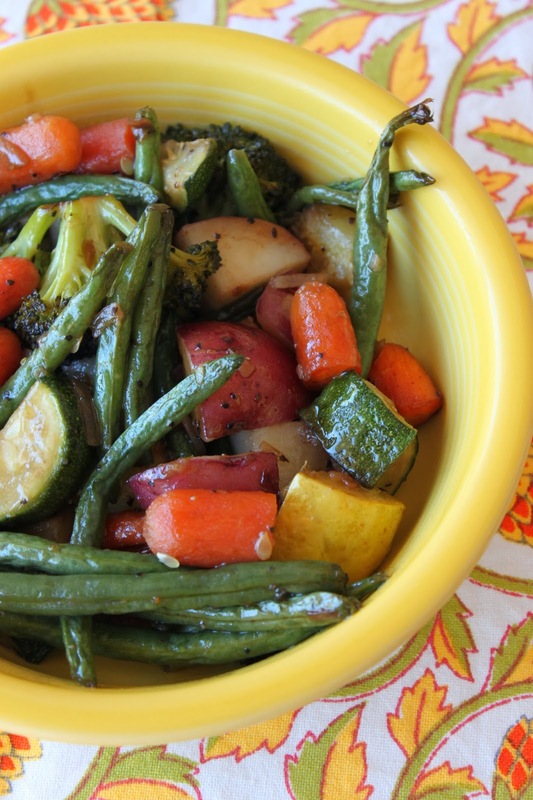 Also, this recipe is easy to customize to your vegetable preferences. 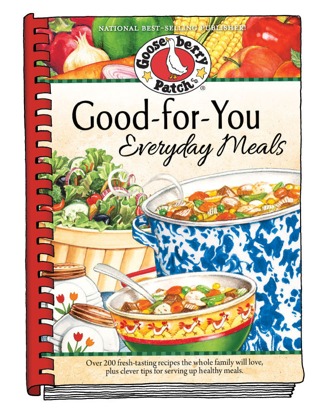 Gooseberry Patch provided me with a review copy of Good-for-You Everyday Meals and has been generous enough to also provide a copy for one of my readers. If you would like your own copy of the cookbook, please enter through the Rafflecopter widget below. Please be patient as it takes a few seconds to load. love there cookbooks, this one looks like a great one. I have never owned any cookbooks. Never can have too many Gooseberry cookbooks. They have wonderful recipes and are colorful and interesting to read. Always have some to give as gifts! Yes, I own numerous Gooseberry Patch cookbooks and love each one of them! I'd love to add this one to my collection. Love Gooseberry Patch Recipes, I have a few of the cookbooks, I would love to own this one as well!!! I have a couple if these cookbooks and would love another one. I think I have about 4 or 5 Gooseberry Patch cookbooks in my collection. Sure would love to own more! I own five Gooseberry Patch cookbooks. I'd love to have one with healthier recipes! I have a few of the Gooseberry Patch books... Always look forward to new ones as they come out! I have 3 Gooseberry cookbooks, and love them all! I have 6 of these cookbooks and love everyone of them, I hope to keep adding to my collection. I have tried two recipes so far and they have both turned out great. I have only had the cookbooks a week. Love these recipes! Thanks for the opportunity. I recently purchased an e-cookbook. Recipes all look delicious.